The Dallas Mavericks had no problem beating the Cleveland Cavaliers 109-90 as Kyrie Irving added to the woes of David Blatt with an ankle injury, which means that two thirds of the big three (including LeBron James) are out of action. Kevin Love remains alone, and was pretty much the only player giving the Mavs any kind of problems. Love finished with 30 points with 10 rebounds, and that was about it for the Cavaliers. Kyrie Irving scored just six points before exiting with ankle pain. Dion Waiters scored just 8 points on 4-of-14 from the field, unable to have consecutive games in which he actually makes a positive difference. 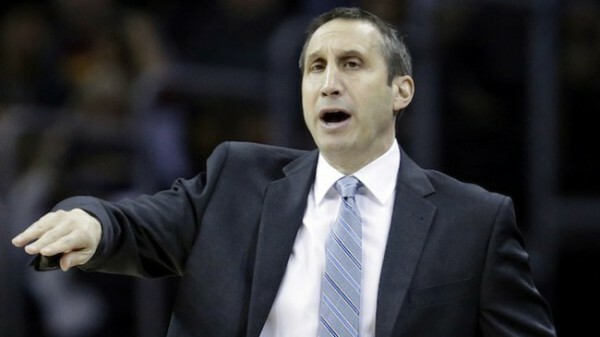 You never know if there really is pressure from within the organization on Blatt to turn things around despite the injuries which make it very difficult, or is it all made up by ESPN and other major media outlets. Sometimes I imagine that there is some mystery smoking man behind the scenes that decides he wants to sway things from time to time, which means the finely oiled media machine starts working a certain angle, powerful enough to generate a reality. But there are the facts, which aren’t that helpful for Blatt. He was hired to help the Cavaliers rebuild and improve. Suddenly, with the addition of James, it turned into a completely different job. While it’s rare to see a head coach fired in his first season, especially when he is still four games above .500 and James isn’t going to be out for very long, but despite the huge contract that will also stand as a deterrent, it’s easy to say no one is happy about the progress or lack thereof with this team so far. A team with Kevin Love and Kyrie Irving shouldn’t look so bad, but it seems it’s very rare and difficult for the Cavaliers to look balanced when Irving and Love are without James. It’s not that they can play the play makers, point forward or point guards, but the system seems to be unable to fill the void at the moment. Now that Irving is gone, it’s going to be Kevin Love’s team for a short while – a worse version of the Timberwolves in recent years. It’s a weird season for the Cavaliers. After four frustrating lottery seasons, it seems their fortune turned into gold and better than that all of a sudden. But a process is always necessary, or always needed. Patience might exist within the organization and even the fan base, but it rarely resides with those who cover the team, expecting them to run all over the Eastern conference. Unless there’s truth in the fact that James doesn’t want Blatt to coach him anymore, the American-Israel “rookie” deserves more time.